A set of useful templates to quickly start using SlackTextViewController. A drop-in UIViewController subclass with a growing text input view and other useful messaging features. Meant to be a replacement for UITableViewController & UICollectionViewController. This library is used in Slack's iOS app. It was built to fit our needs, but is flexible enough to be reused by others wanting to build great messaging apps for iOS. Inverted Mode for displaying cells upside-down (using CATransform) -- a necessary hack for some messaging apps. YES/true by default, so beware, your entire cells might be flipped! Dynamic Type for adjusting automatically the text input bar height based on the font size. Copy and drag the Source/ folder to your project. or compile the project located in Builder/SlackTextViewController.xcodeproj to create a SlackTextViewController.framework package. You could also link the library into your project. SLKTextViewController is meant to be subclassed, like you would normally do with UITableViewController or UICollectionViewController or UIScrollView. This pattern is a convenient way of extending UIViewController. SlackTextViewController manages a lot behind the scenes while still providing the ability to add custom behaviours. You may override methods, and decide to call super and perform additional logic, or not to call super and override default logic. 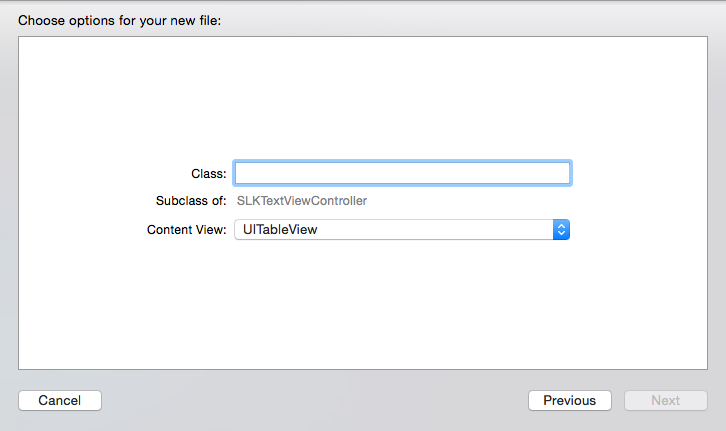 Start by creating a new subclass of SLKTextViewController. Protocols like UITableViewDelegate and UITableViewDataSource are already setup for you. You will be able to call whatever delegate and data source methods you need for customising your control. Calling [super init] will call [super initWithTableViewStyle:UITableViewStylePlain] by default. When using SlackTextViewController with storyboards, instead of overriding the traditional initWithCoder: you will need to override any of the two custom methods below. This approach helps preserving the exact same features from the programatic approach, but also limits the edition of the nib of your SLKTextViewController subclass since it doesn't layout subviews from the nib (subviews are still initialized and layed out programatically). Check out the sample project, everything is demo'd there. There are 2 main examples (different targets) for testing the programatic and storyboard approaches, and a Swift example. Most of the features are implemented for you to quickly start using them. The text view expands automatically when a new line is required, until it reaches its maxNumberOfLinesvalue. You may change this property's value in the textView. On iPhone devices, in landscape orientation, the maximum number of lines is changed to fit the available space. 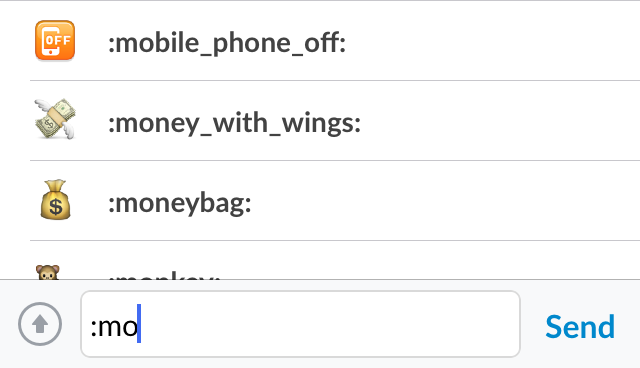 We use autocompletion for many things: names, channels, emoji, and more. Every time a new character is inserted in the text view, the nearest word to the caret will be processed and verified if it contains any of the registered prefixes. Once the prefix has been detected, didChangeAutoCompletionPrefix:andWord: will be called. This is the perfect place to populate your data source and show/hide the autocompletion view. So you must override it in your subclass, to be able to perform additional tasks. Default returns NO. The autocompletion view is a UITableView instance, so you will need to use UITableViewDataSource to populate its cells. You have complete freedom for customizing the cells. You don't need to call reloadData yourself, since it will be invoked automatically right after calling the showAutoCompletionView method. The maximum height of the autocompletion view is set to 140 pts by default. You can update this value anytime, so the view automatically adjusts based on the amount of displayed cells. If the user selects any autocompletion view cell on tableView:didSelectRowAtIndexPath:, you must call acceptAutoCompletionWithString: to commit autocompletion. That method expects a string matching the selected item, that you would like to be inserted in the text view. The autocompletion view will automatically be dismissed and the chosen string will be inserted in the text view, replacing the detected prefix and word. You can always call cancelAutoCompletion to exit the autocompletion mode and refresh the UI. To enable edit mode, you simply need to call editText:, and the text input will switch to edit mode, removing both left and right buttons, extending the input bar a bit higher with "Accept" and "Cancel" buttons. Both of this buttons are accessible in the SLKTextInputbar instance for customisation. To capture the "Accept" or "Cancel" events, you must override the following methods. Notice that you must call super at some point, so the text input exits the edit mode, re-adjusting the layout and clearing the text view. Use the editing property to know if the editing mode is on. You can register markdown formatting symbols so they can easily be used to wrap a text selection, with the help of the native contextual menu, aka UIMenuController. This feature doesn't take care of the rendering of the markdown: it's sole purpose is to ease the formatting tools to the user. Optionally, you can enable autoCompleteFormatting so any pending markdown closure symbol can be added automatically after double tapping on the keyboard spacebar, just like the native gesture to add a sentence period. The sentence period is still being added as a fallback. You must first register the formatting symbol and assign a title string to be used in the menu controller item. Futher more, you can customise some of the behavior for special formatting cases, using the UITextViewDelegate methods. In the following example, we don't present the Quote formatting in the contextual menu when the text selection isn't a paragraph. In this other method implementation, we don't want to allow auto-completion for the Quote formatting since it doesn't require a closure. Optionally, you can enable a simple typing indicator, which will be displayed right above the text input. It shows the name of the people that are typing, and if more than 2, it will display "Several are typing" message. and the view will automatically be animated on top of the text input. After a default interval of 6 seconds, if the same name hasn't been assigned once more, the view will be dismissed with animation. Dismissing the keyboard with a panning gesture is enabled by default with the keyboardPanningEnabled property. You can always disable it if you'd like. You can extend the verticalPanGesture behaviors with the UIGestureRecognizerDelegate methods. A shake gesture to clear text is enabled by default with the undoShakingEnabled property. You can optionally override willRequestUndo, to implement your UI to ask the users if he would like to clean the text view's text. If there is not text entered, the method will not be called. If you don't override willRequestUndo and undoShakingEnabled is set to YES/true, a system alert will be shown. To add additional key commands, simply override keyCommands and append super's array. Dynamic Type is enabled by default with the dynamicTypeEnabled property. You can always disable it if you'd like, but the text input bar would still adjust to best fit the font size of the text view. We have prepared a set of useful Xcode templates so you can quickly start using SlackTextViewController. These templates are also available in Alcatraz.